In 1935 EV Ingraham left Unity, after 25 years of on-and-off service to Mr. Fillmore, and the set out to be an independent writer. The first book he published as an independent author is Prayer, Its Practice and Its Answer, which is now available to read online and to download as a PDF (scroll down for links to the PDF and to the individual chapters). It was published in 1935 by Douglass DeVorss, his colleague and friend at Unity, who had also left Unity to start what has become the world's premier publisher of metaphysical books. Fortunately for us, the copyright was never renewed and so we are able to share it freely. Eleanor Fleming got hold of a copy a few months ago and discovered in it some of the most profound teachings on prayer and meditation she has ever read. I agree. 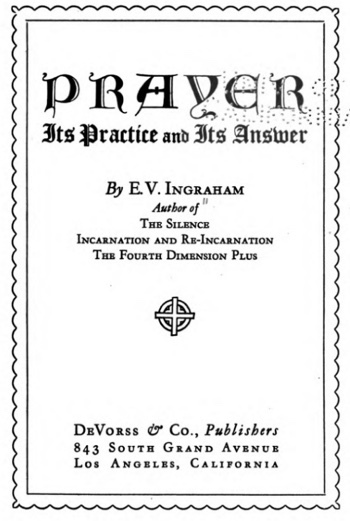 Ingraham's chapter on "Answers to Prayer" has been very helpful to me personally. Thank you, Eleanor, for bringing this book back into Unity consciousness!